Racine, April 7, at her residence, Sturino Funeral Home, Racine. Racine, April 13, Willowcrest Care Center, South Milwaukee, Maresh-Meredith & Acklam Funeral Home, Racine. 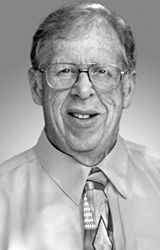 RACINE—Surrounded by his loving family, Daniel M. Worden, age 68, passed away Saturday, April 6, 2019 at his residence. He was born in Racine, , son of the late Merle and Beverly (Nee: Koeshall) Worden. Dan was a graduate of J.I. Case High School “Class of 1969”. On October 18, 1991 he was united in marriage to Ann M. Johansen. He was a member of Racine Assembly of God. Dan had a great love for baseball and was a huge Milwaukee Braves/Brewers fan. A collector of sports cards, he also enjoyed gardening, antique car shows and finding treasures at rummage/estate sales. Above all he cherished time spent with his family. He will be dearly missed by his loving wife of twenty-seven years, Ann; his children, Danielle and Andrew; loyal canine companion Bucky; sisters and brothers, Rachel (Terry) Mix, Janice Hemauer, Rachel, Paul, Tim and Ron Worden; numerous brothers-in-law and sisters-in-law, nieces, nephews, other extended families and dear friends. In addition to his parents he was preceded in death by his grandparents, Harley and Ruth Koeshall; brother, Nathan Worden; and beloved pets, Bo and Rags. Funeral services will be held Saturday, April 20, 2019, 10:00 am at the funeral home. Relatives and friends may meet with the family Friday at the funeral home from 4:00 pm until 7:00 pm (Time of Reflection 6:30 pm) and Saturday at the funeral home from 9:30 am until time of service at 10:00 am. Private interment will be held at Calvary Cemetery. On April 8,2019 Jessie Lorraine (Millstead) Wilson joined her friends and family into eternal life. Jessie was brought into this world June 9,1932 daughter to the late Carlyle and Jessie Millstead. Jessie married her love of life, the late Lewis Wilson.They were married 64 years at the time of Lew’s passing. Together they gave life to three children. Dawn Haas (James), Jane Wilson, Joe Wilson(Lisa). Also grandchildren Nicholas Gimino, Colin, Jonas and Adrianna Wilson, great-grand children, Nathan Dieter and Breanna Gimino. Jessie is also survived by her sister Carol Timmons and brother David Millstead, former daughter-in law Laura Neibaur, along with many nieces and nephews, friends and relatives. She was a social woman who in youth sewed, knitted, crocheted. Jessie had made a decision long ago to donate her body to the Wisconsin Medical College. She will be interned at the Southern Wisconsin Veterans Memorial Cemetery. Jessie had a great love of horses which continued until her last breath. For those wishing to remember Jessie in a special way may make donations to SMILES (Special methods in learning equine skills) N2666 County Rd. K. Darien, WI. 53114. There will be a celebration of Jessie and Lewis’ life at the Bartlett Youth Foundation 1120N Stuart Rd.Mt Pleasant, WI. 53406 on May 12th from 12 to 4. We will be having a picnic lunch. All Mom’s invited. RACINE—Susan “Sue” G. Weitzel, age 66, passed away Monday, April 8, 2019 at Froedtert Memorial Hospital, Wauwatosa. Funeral services will be held Monday, April 15, 2019, 11:30 am at the funeral home. Interment will follow at Holy Cross Cemetery, Hwy 32. Visitation with relatives and friends will be held Monday from 10:00 am until time of service at 11:30 am at the funeral home. Mark S Cunningham , 64, of Rochester, MN formerly of Racine, WI. Passed away peacefully on Thursday, April 4, 2019, at Eden Brook Nursing Home, Rochester, MN. following a battle with cancer. He was born on Dec. 7, 1954 in Milwaukee, WI. The son of Thomas and Joan(nee: Ruetten) Cunningham and raised in Racine. He served in the United States Navy. He is survived by his mother Joan (Sally), 5 brothers and sisters. Dale (Nancy) Cunningham, and Kurt Cunningham, of Racine, Rick (Judy Theama) Cunningham, of Green Bay, Erin (Clem) Stublaski of Union Grove and Beth (Neal) Neubauer of Mount Pleasant, 11 nieces and nephews, 10 great nieces and nephews and other relatives and friends. Preceded in death by his father (Tom). Mark’s family would like to extend a sincere thank you to the staffs at Silver Creek Corner, St. Croix Hospice, Olmsted Medical Center Hospital and Eden Brook Nursing Home, for the care and compassion given to Mark. In memory of Mark, offer a kind deed to someone in need. RACINE—Sherry Lynn Henkel, 58, passed away unexpectedly on Wednesday, April 10, 2019. She was born in Racine on March 27, 1961, the daughter of the late Donald John and Jacqueline Louise (nee: Roushia) Henkel. She graduated from JI Case High School in 1979. After high school, Sherry attended Carthage College, and U.W. Parkside, to broaden her education. Sherry worked as a certified nursing assistant for Westview Nursing Home and Lincoln Lutheran Home. Earlier in life, Sherry enjoyed playing in city softball leagues. She loved reading, puzzles, cribbage, cards and scrapbooking. However, she mostly enjoyed being in the company of her family. Sherry is survived by her brother and sisters, Barry John (Chris) Henkel, of Mount Pleasant, Laura Jean (Blake) Rogers of Kenosha, Karen Louise Henkel, and Linda Leigh (Lat Martens) Coutts all of Racine, and Dawn Marie (Jonathan) Kiepert of Greenville, SC; as well as many dear nieces and nephews, relatives and friends; especially her special friends, Dorothy and Debbie. Family and friends are invited to meet in the Draeger-Langendorf Funeral Home and Crematory on Wednesday, April 17, 2019 for a visitation from 4-6 p.m. A service celebrating and remembering her life will follow at 6:00 p.m. A private interment will take place at Graceland Cemetery. In lieu of flowers, memorials in Sherry’s name have been suggested to the Wisconsin Humane Society – Racine Campus. RACINE—With her daughters by her side, Catherine “Cathy” G. Hahn, age 66, passed away Monday, April 8, 2019. A Mass of Christian Burial will be celebrated Tuesday, April 16, 2019, 10:00 am at St. Richard Catholic Church, 1503 Grand Avenue, with Rev. Allen Bratkowski officiating. Interment will follow at Holy Cross Cemetery, Hwy 32. Relatives and friends may meet with the family Monday at the funeral home from 4:00 pm until 7:00 pm and Tuesday at the church from 9:30 am until time of Mass at 10:00 am. RACINE—Kathleen M. “Katee” Genrich, age 71, passed away unexpectedly on Monday April 1, 2019 at her residence. Katee will be dearly missed by her children, Erin Genrich of Racine, Adam (Jessica) Genrich of Lake Geneva; other relatives and friends. There will be gathering to celebrate Katee’s life at the Racine Yacht Club, 1 Barker St, on May 22nd, 2019 at 6pm. In lieu of flowers, memorials to the family have been suggested. Jean L. Jones of Two Rivers, WI went to be with her Lord on April 10th, 2019. Jean was born to Michael and Ann (Sekey) Predny January 26, 1936 in Chicago and lived most of her life in the Racine area. The passion of Jean’s heart was sharing her love of Jesus Christ with others and telling them that Jesus loves them. She also loved to read and going shopping. She greeted new friends and old with a sweet smile and out stretched hand. Jean was married for 60 years to Ray L. Jones. Ray preceded Jean in death September 7th, 2018. They had five children; surviving are daughters and son in law: Christy George, Terri and Michael Adsit, Peggy Jones; preceding in death were sons Michael and Mathew Jones. Jean’s grandchildren are: Theresa (Clint) Fandrei, Kari Tower-Sevick (Michael Sevick), Allison George, Tony George, Brianna George, Michael (Ida Mae) Adsit Jr., Victoria (Justin) Schwahn, Jonathan (Danielle) Adsit. Also, great grandchildren: Theodore, Tyler and Autumn Fandrei; Gloriana Schwahn and Hezekiah Adsit. Jean’s sisters are Mary Ann Rugg, Mickie (Ron) McCallum, Janet Smith. Also surviving are aunt, Alice Petersen, and many nieces, nephews and cousins. A service will be held at Southern Wisconsin Veterans Memorial Cemetery at 12:00 on Thursday, April 18th. Special thanks to the staff of Hamilton Care Center for the excellent, compassionate care that they showed Jean. The family also greatly appreciates the many kindnesses and friendship shown to Jean by her church family at Renew Church. RACINE—Barbara B. Mattner, age 72, passed away Saturday, April 6, 2019 at Bay Harbor. RACINE—Francis ‘Doc’ L. Olley, age 89, passed away Friday, April 12, 2019 at St. Monica’s Senior Living. A Mass of Christian Burial will be celebrated Wednesday, April 17, 2019, 11:00 am at St. Rita Catholic Church, 4339 Douglas Avenue, with Rev. Rich O’Leary OSA officiating. Entombment will follow at Holy Cross Garden Mausoleum, Highway 32. Relatives and friends may meet with the family at the funeral home on Tuesday from 5:00 pm until 7:00 pm and Wednesday at the church from 9:30 am until time of Mass at 11:00 am. Please see Monday’s Journal Times for a complete notice. CALEDONIA—Glenn E. Hubrich, age 84, at peace April 12, 2019. Visitation at St. Paul’s Lutheran Church, S66 W14325 Janesville Rd., Muskego on Monday, April 15th from 1-3 PM. Funeral Service 3 PM. See funeral home website www.hartsonfuneralhome.com for full notice. Michael went to his home in heaven on April 3, 2019 in Boynton Beach, Florida at the age of 97. He was born in Racine, Wisconsin on April 25, 1921. Michael was a loving husband, father, and grandfather who dedicated his life to providing a better life for his family. He married his best friend Shirley Francois on September 4, 1948. They raised two daughters, Kathy Johnson (Timothy) of Boynton Beach, FL, Michelle Long (Neel) of Heathrow, FL, two grandchildren: Michael Johnson (Caroline) of Delray Beach, FL, and Kevin Johnson of Boynton Beach, FL, three great grandchildren: Tyler, Kailey, and Declan, and survived by his brother in law Ray Francois of Racine, WI. Michael started Michael’s Machine Co. in Racine, WI on May 10, 1948. The company was very successful until he sold it in 1986. Upon his retirement he moved to Boynton Beach, FL and spent his summers at Eagle Lake. He was very active with the VFW in Kansasville in which he helped raise money annually at the local county fair. Funeral services will be held at a later date at St. Rita’s Church in Racine. RACINE—James D. Shawl, 76, passed away in the Ridgewood Care and Rehabilitation Center on Sunday, April 7, 2019. In keeping with wish a private service was held. Thomas J. Graham "Uncle Tom"
RACINE—Thomas Jerome Graham was born on December 20, 1932 in Racine, Wisconsin, and entered into eternal life on April 9, 2019, surrounded by his family. He was the fifth of seven children of John Lawrence Graham and Catherine (Packamore) Graham. He graduated from St. Patrick’s school in 1949. He was drafted into the U.S. Army in 1953 and served until 1956 as a Paratrooper in the 11th Airborne completing nineteen jumps. On May 3, 1958, at St. Patrick’s Church he was united in marriage to Suzanne Emerson who preceded him in death on February, 29, 2004. Tom and Sue were lifetime members of St. Patrick’s Church. They had four children: Brian, Mary, John and Bridget. Tom was a machinist for J.I. Case for 31 years, retiring in 1988. In retirement he enjoyed spending summers in Alaska visiting his daughter, Mary, fishing for Salmon and Halibut. They shared many adventures over the last 15 years. Tom was a jack of all trades and would tackle any project around the house. He was a proficient plumber, mechanic, painter and woodworker. Tom enjoyed golf, and played in the Commercial Golf League and the Washington Park Retired Men’s League for many years. He also played Dart Ball with St. Patrick’s in the Church League. He spent his Sundays watching the Green Bay Packers. Tom was a member of the J.I. Case 20 Year Club, Local 180 Retirees, and the Racine Ski Club. Surviving are his four children: Brian “Stoney” (Jody Graceffa) Graham, Mary Graham, John Graham, and Bridget (Dave) Arkenberg. Grandson, Nathaniel (Brittany Bergeron) Barnett, Great Grandson, Maximus Barnett. One brother, William (Patricia) Graham, of Sunland California. Sisters-in Law, Barbara Presser and Jenny Emerson of Racine, and a host of nieces, nephews, cousins, and other relatives and friends who all knew him as “Uncle Tom”. In addition to his Wife and Parents, he was preceded in death by his siblings and their spouses: John “Bud” Graham, Mary (Edward) Lockhart, Charlotte (Arnold) Anderson, Patricia (Kenneth) Bisher, and Charles Graham. Mother and Father In-Law, Bradford and Alma Emerson, Brothers-in Law Charles Presser and Kenneth Emerson, and Sister in Law Colleen Graham. A Mass of Christian Burial will be held on Wednesday, April 17, 2019 at 10:00 a.m. at St. Patrick’s Church, 1100 Erie Street, Racine, Wisconsin. Relatives and friends may meet with the family on Tuesday, April 16, 2019 from 5 to 7 p.m. at the funeral home and on Wednesday at the church from 9a.m. until the time of Mass at 10:00 a.m. Interment with Full Military Honors will take place following the service at Holy Cross Cemetery, Hwy 32, Racine, Wisconsin. In lieu of flowers, memorials may be directed to St. Patrick’s Church, The Choral Arts Society of Southeastern Wisconsin, Adaptive Sportsmen, Inc., or the charity of your choice. Special thanks to Aurora At Home Hospice for their loving and compassionate care during Tom’s final weeks. RACINE—Elaine Marie Seidel, wife, mother, grandmother, great-grandmother, nurse, sister, aunt, friend and traveler, died of natural causes on Friday April 5th, just 12 days shy of her 93rd birthday. Elaine was a lifelong resident of Racine. She was born there in 1926, to Victor and Amelia Christoffersen. Elaine attended the Mercy Hospital School of Nursing in Janesville, Wisconsin, graduating as a Registered Nurse in 1947. That was a busy year for her, as she started her nursing career while preparing to marry her sweetheart, Bill Seidel the following year, May 1, 1948. Their long marriage lasted nearly 68 years, until Bill’s death in 2016. Together they nurtured and loved four children, Bill (Linda), Diane (Frank Miller), Peggy, and Bob (Bonnie). For many years, Elaine fulfilled her passion for children and life by working as a delivery room nurse at both St. Luke’s and St. Mary’s Hospitals. She took great pride in how gracefully she balanced raising her family with long nights at the hospital. She ended her nursing career caring for others at the Racine County High Ridge Care Center. After retiring, Elaine and Bill hit the open road in their Jayco J RV. Elaine loved playing co-pilot and manning the maps while they cruised south to spend winters in Arizona, Texas, and Florida. In her later years, as her physical mobility decreased, she often recounted the magic of those years. Relaxation in warm climates, the open road, and great spans of time with her husband were some of her most cherished memories. Elaine’s four children and their spouses, six grandchildren and their spouses, and ten great-grandchildren will remember her most as the nexus of the Seidel family social life. She organized and executed epic Christmas parties, birthday celebrations, Easter parties, bike riding parties, and parties for no good reason other than to just be together as a family. She was a cheerleader and celebrator. Chef of exquisite comfort food dishes, cherry jello with bananas and baker of angel food cake of unrivaled delishness, she made sure everyone in her family was well-fed and well-hugged. They always were. This, above all else, is her greatest legacy—the tremendous amounts of herself she shared with those she loved. A woman of deep faith. Elaine was a dedicated parishioner of St Lucy’s Catholic Church. She was frequently seen with a rosary in her hands. Even in her final days, she kept her rosary close, a true and visible testament to her unyielding belief in God. She is preceded in death by her husband, Bill, her parents Victor and Amelia Christoffersen, brother Chuck Christoffersen, sister Janice Anderson, brother-in-law Glenn Anderson, and son-in-law Dan Schmidt. A Mass of Christian Burial will be celebrated on Elaine’s 93rd birthday—Wednesday , April 17, 2019 at 12:00 noon in St. Lucy Catholic Church, 3101 Drexel Avenue, with Rev. Javier Guativa officiating. A memorial luncheon will follow. Visitation will be in the church on Wednesday from 10:00 am – 12:00 noon. Private interment will take place at Holy Cross Cemetery – Highway 32. Memorials are suggested to Saint Lucy’s Catholic Church in Racine or the American Cancer Society. The family would like to thank the staff at the Home Harbor Assisted Living Community, Lakeshore at Siena and Hospice Alliance for the care and compassion they showed Elaine in her senior years and final days. RACINE-William “Bill” Darrell Gandee, Jr., 81, passed away at his residence on Wednesday, April 10, 2019. RACINE—Sylvia Rae Tyree, age 46, passed away unexpectedly Thursday, April 11, 2019, at The Villa at Lincoln Park. She was born in Racine, August 14, 1972, daughter of the late Robert and Nancy (Nee: George) Norbert. Growing up, Sylvia was taken in raised by her grandparents Richard and Ann Peterson for 7 years and then by her aunt Kathy and uncle Dean Erhardt and family for 4 years. On August 2, 1996 she was united in marriage to Daniel R. Tyree. Many will fondly remember Sylvia waitressing at Dino’s Restaurant where she worked for over 15 years. For Sylvia it was all about family. She treasured her time as a devoted wife and mother and will be dearly missed. In addition to her family she held a special place in her heart for her beloved pets, especially Sydney, Jax, Brody, and Yoshi. Surviving are her husband of 22 years, Dan; her beloved children, Dustin Lalor and Ashley Tyree; special aunt and uncle, Kathy and Dean Erhardt; special aunt, Marjorie (Mario) Bruno; special cousins Jenifer (David) Fechner (and their children Destiny and Jeremiah), Jimmy Erhardt (Lisa), Christina Davis; mother-in-law, Sis Hansen; special friend, Julee Blawat; many in-laws, other relatives and dear friends. In addition to her parents she was preceded in death by her grandparents, Richard and Ann Peterson, Richard and Mary Borglin. A memorial service will be held at the funeral home, Tuesday, April 16, 2019, 1:00 p.m. with Reverend James Gambill officiating. Relatives and friends may meet with the family prior to the service 11:00 a.m. until 1:00 p.m. Memorials to the family have been suggested. The family wishes to extend a special thank you to Dr. Ryan Engel for his loving and compassionate care. RACINE—Beverly Ann Leinweber, age 82, passed away peacefully surrounded by her family at home Tuesday, March 26, 2019. She was born in Eldorado, IL, October 1, 1936 daughter of the late Ethel (Nee: Goulston) and Donald Lonstrup. Bev grew up in Racine and graduated from Lutheran High School “Class of 1954”. She was employed by Western Publishing for a number years and as a waitress at Wells Bros for over 20 years. On July 20, 1991 she was united in marriage to Ronald L. Leinweber. Bev was an avid gardener who enjoyed her plants and flowers. She also enjoyed bird watching and in her younger years bowling. She was a devoted wife, mother, and grandmother who will be dearly missed. Surviving are her husband, Ron; children, Terri (Kurt) Mandli, Don (Debbie) Fowlkes; grandchildren, Allen (Brandy) Smith, Lyndee (Brian) Anzalone, Mara, and Alei Mandli, Brayden Fowlkes; great grandchildren, Felicity, Elizabeth, and Otis Smith, Annistyn Anzalone; in-laws, Ione Davison, Phyllis Cummings, Ed (Sharon) Leinweber, Jean (Alvin) Elliott, Joyce (Rich) Gustin, Sharon (the late Joseph) Leinweber, Art Leinweber; special niece, Louise Goman; special friends, Terry and Andy; numerous nieces, nephews, other relatives and friends including her feline friends, Marshmallow and Eclipse. A memorial service will be held Saturday, April 20, 2019, 2:00 p.m. at the funeral home with Reverend Sid Bouldin officiating. Relatives and friends may meet prior to the service 1:00 p.m. until 2:00 p.m. The family wishes to extend a special thank you to Dr. Clark, Dr. Engel, the 3rd floor nursing staff at Ascension All Saints and Grace Hospice for their loving and compassionate care.